The AALL Spectrum blog has moved to inside AALLNET, http://www.aallnet.org/blogs/spectrum-blog. Within AALLNET it should be more readily found by AALL members yet still viewable my non-members. All the archived content will remain on this site for the foreseeable future. Law librarians know the value of law librarians, even when they struggle to articulate that value to others. It pleases us when someone aptly describes what we do; and it satisfies even more when that praise comes from a user. One such example comes from Judy Zimet, a law student coach, in a post, “All Hail the Law School Library Staff” on her blog. 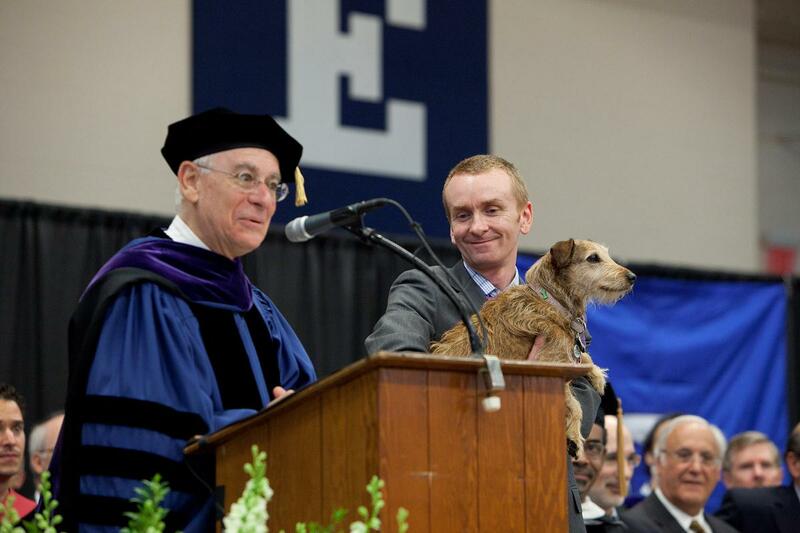 Monty, our Yale Law library therapy dog (owned by me) appeared at Yale Law’s commencement this year. He gave a short speech (translated by the Dean of the Law School), and was roundly cheered! I’m attaching a picture you might want to use. In the picture, you see me holding Monty, whilst Dean Robert Post ‘translates’ Monty’s best wishes to the graduating class. caught my attention for two reasons: commencement ceremonies and Monty lead to a Spectrum article about USF Zief Law Library’s program to check out therapy dogs.